Our Spring / Summer exhibition will highlight the work of the Dungarvan Photographer Edmond Keohan (1852-1934). This is the first retrospective exhibition on the photographer's work. While Edmond was born in Tramore he spent the major part of his life in Dungarvan at 17 Main Street (now Dunphy Insurance). Keohan was the first person to compile and publish a history of Dungarvan. This was published in 1924, illustrated with his own photographs. The book is particularly valuable in its coverage of the War of Independence / Civil War period and the photographs of the destruction which took place in Dungarvan and district. There are many new photographs in the exhibition which have not been published. The exhibition will include a sample of Keohan's work- portraits, buildings, streets, events, leisure, War of Independence etc. 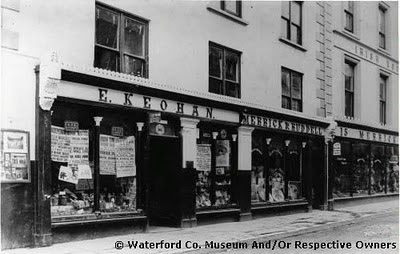 As well as being a photographer Keohan was also Chairman of Dungarvan Town Commissioners, President of the Dungarvan Literary Society, member of the Dungarvan Rambler's Club. He was also an excellent billiards player. The exhibition also includes cameras used by Keohan. There will be an opportunity to handle a stereoscopic viewer showing 3D images. The exhibition will be officially opened by Broadcaster and Historian Julian Walton on Friday 23 April at 8 p.m in Waterford County Museum. The exhibition opens to the general public on Monday 26 April.